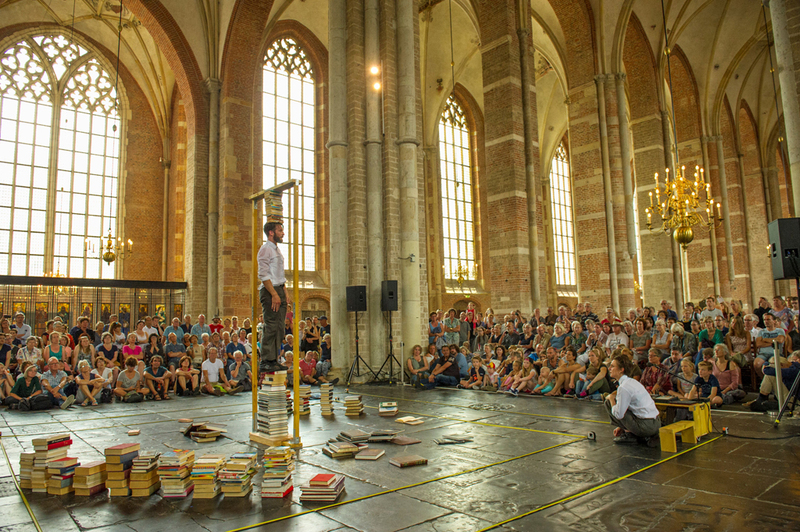 A game of astute construction and of fragile architectures, involving a dancer, a reader and 363 books. FOSSIL connects the materiality of books and impalpability of words. Through the human-book manipulations, emanates a body and a voice. 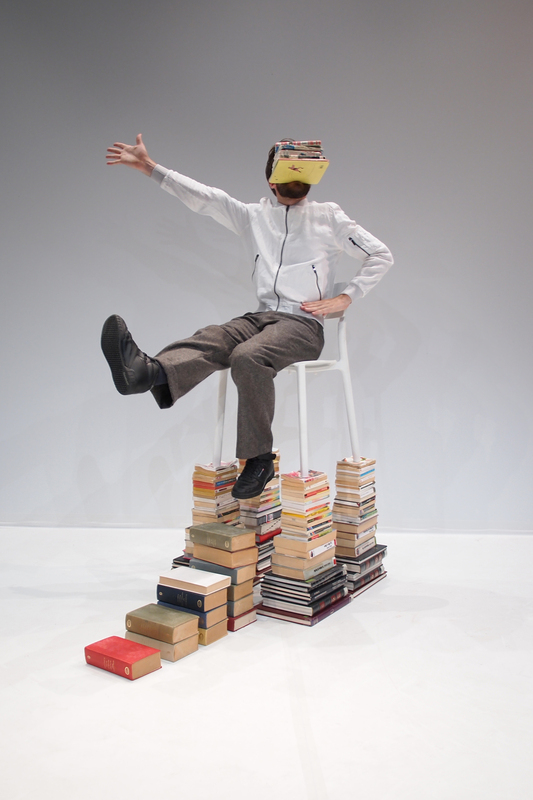 FOSSIL is an exploration of the object, the book, as it becomes a transmitter of choreography and sound. FOSSIL is a choreographic and sound performance for two performers. 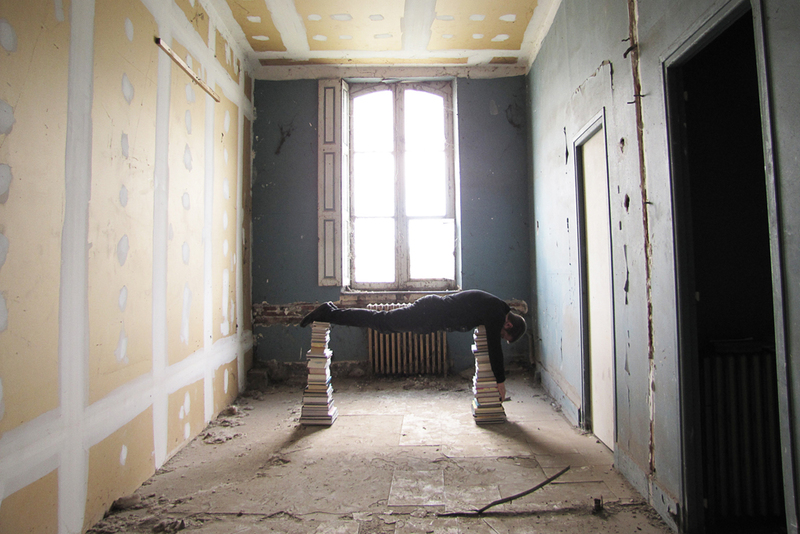 A dancer and a reader manipulate all facets of the book; from the text to the format, to the binding to the author. In this physical poetry, body and text are staged as fragile monolithic architectures or landscapes of strange and shifting characters. Combined with musical readings, the texts are composed from the Cut up* technique. Texts then resonate like images in movement, where the body is heard and reading is watched. 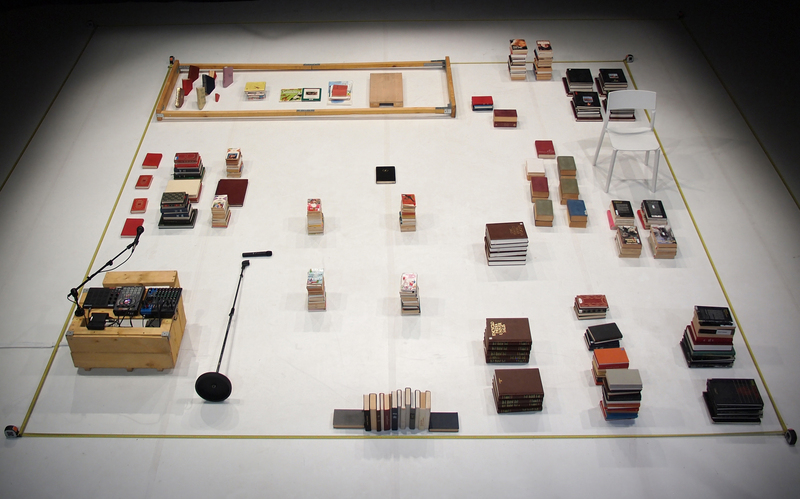 Conceived as “sculptural readings”, this performance/installation involves 363 books, making up the whole of the set design. Words and images explore the sensations written by a broad array of authors- from different styles and epochs. These texts explore emotions well known to us all, ripe throughout our daily life, such as loneliness, love, doubt, death. Bringing together the text of different written works, the text created becomes a dialogue or a conversation between authors such as Fernando Pessoa to Gherasim Luca, Albert Camus to Oscar Wilde, William Shakespeare to Jack Kerouac and many others. Words and images arise through the body’s action as moving and absurd fragments or lost emotions and sensations from everyday are revisited in an abstract and poetic way. Between installation and live performance, FOSSIL is a visual and sound exploration structured like a book. In two chapters, one prologue and an tabula gratulatoria which move to and be heard by the spectators installed around the space. The choreography is inspired by the gestures of the builder or architect. In the choreographic inertia, the body works; feeling and manipulating the elements with precision and thoroughness, building and deconstructing precarious and unstable architectures. In a game with gravity, the body and voice form a sensitive and graphic dialogue. FOSSIL connects the materiality of books and the impalpability of words as an invitation to revisit one’s own personal library of memories. 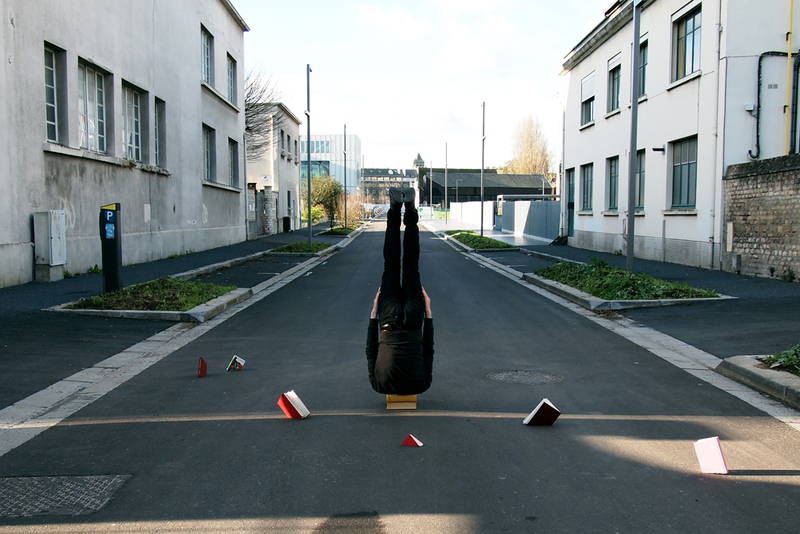 This project is supported by SACD (Auteur D’espace) , Coopérative Nantes/Rennes : The Fabriques Laboratoire artistique and L’association Au Bout du Plongeoir, Maison du Livre de Béchérel, La Ville de Nantes, du Conseil Régional Pays de la Loire, de la Ville de St Hilaire de Riez, the DOG net work (Danse Grand Ouest) , Le Sept Cent Quatre Vingt Trois in Nantes (fr), Les Ateliers Intermédiaires in Caen (fr) ,TEEM in Quimper (fr), Tribu Familia in Mayenne (fr), le Lieu Unique in Nantes (fr).